Ok, maybe I've glossed over the fact that BGICT has been hitting midtown in the evening hours of late. Nevertheless, the vanilla soft serve coated in curried toasted coconut was certifiably delicious. 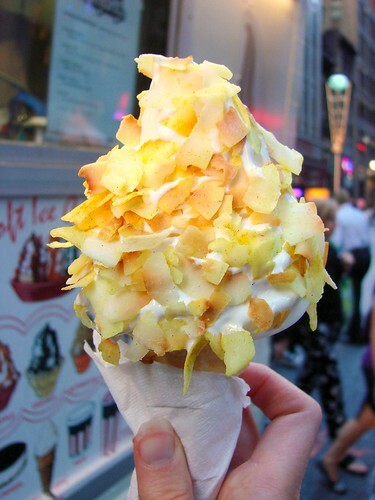 At this year's Food Show I fell in love with the a curried coconut ice cream from Vosges. With lovely and toothsome coconut shavings toasted with just the right amount of curry BGICT's version did not disappoint. For those of you who work late hours in midtown, this is definitely incentive to bust out of the office on a hot summer night. Keep up with their whereabouts via twitter. That is the best looking thing I've ever seen.